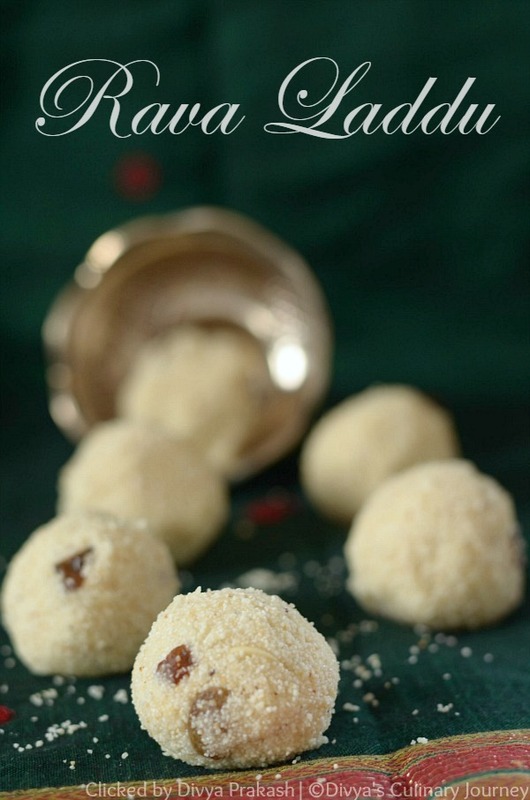 I am going to share Rava laddu Recipe today. As it is festive season, fellow bloggers are posting a lot of festive recipes and I wanted to post one too. So I decided to make Rava ladoo, as both my kids are fond of laddus. Specially my elder one likes Laddu made of Rava(semolina) so much. My aunt makes it specially for my daughter whenever we visit her. Rava laddu is a easy to make sweet and it can be made even in the last minute.It will be ready in few minutes and does not require any preparation, also it requires only few ingredients. 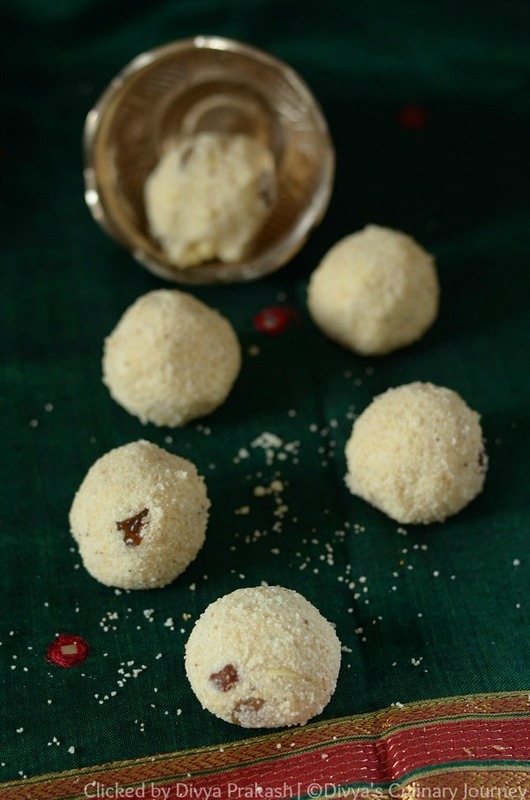 This version of Rava laddu is the simplest one and does not need any grated coconut or condensed milk. 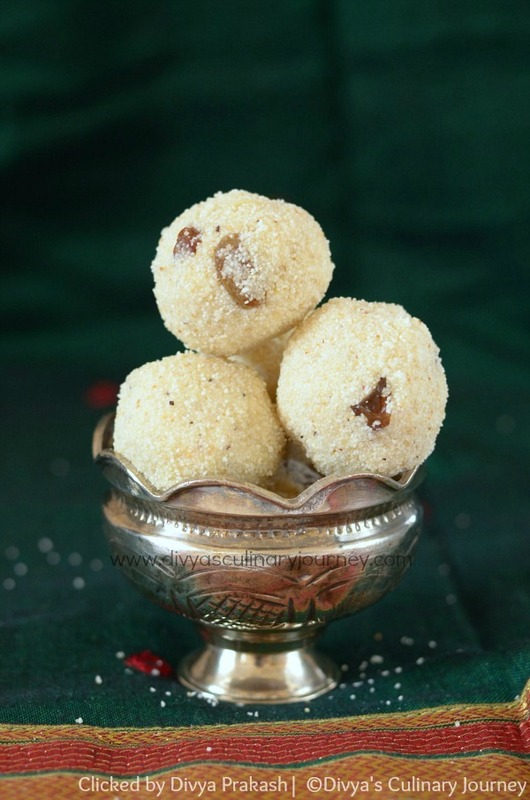 How to make Rava Laddu? Heat one table spoon of ghee in a pan and fry cashews and raisins and take them out and keep it aside. To the same pan, add rava and roast it till slight aroma comes. Take care not to burn it or over roast it till there is change in color. Powder about half a cup of roasted rava coarsely and leave the other half as such. Transfer both into a bowl. Remove the cardamom seeds and powder them with about couple of tablespoons of Sugar.Then add the rest of the sugar and powder them finely too. Add this to the rava mixture. Melt the remaining 3 Tablespoons of ghee and add the warm ghee to the rava sugar mixture, also add the fried cashews and raisins, mix well and try to form laddu shape when it is still warm. If forming laddu is difficult (with rava falling apart and not keeping the shape well), you can add warm milk and then make the shape. Prepare laddus with the rest of the mixture, let them set well. Then transfer them to airtight container. Milk will act as a binding agent. But shelf life of the laddu will be less when milk is added so keep them refrigerated and consume with in a week. You can add more warm melted ghee instead of milk too. The number of laddus you get depends on the size of laddus you make. For the size I made, I got about 16 laddus. I have added only 1/2 cup of sugar, as my kids avoid anything overly sweet and this sweetness was right for us. But if you want more sweetness then you can add another 1/4 cup of sugar. Nice pics divya.. its been ages i made em.. they r mouth watering.. They are my favorite too, nice clicks!! lovely pics :) rava laddu looks delicious. Such a simple recipe and a tasty delicious sweet ready in a short time. Nice pics.